traitor bicycles inhabit the portion of north america that seems obsessed with the bicycle; not oregon, but the next state up; washington. they make a variety of models from steel tubes, covering everything from fixed, to single speed, to cross, to a disc equipped road bike. it's a really good name for a bicycle; the traitor luggernaut, even if it didn't sport an all steel frame joined in a lugged manner. old skool at its best. probably the only nod towards modernity, and i mean this not to cast aspersions towards those currently working in this seemingly unretirable material, is by way of a 1.125" aheadset, thankfully not of the integrated variety. situated at the foot of the seat tube and its second set of bottle bosses, is that most coveted of decals, the columbus bird, signifying in this case, columbus thron tubing. with its extremely minimalist appearance (the beautifuly scripted word traitor appears only on the seat tube) it's some of the best framing i've seen, and i mean that in both senses of the word. and just to gain major brownie points, the head tube bears a proper badge; and a very good one at that. the fsa aheadset grabs hold of a steel steerer attached to traitor's katana fork featuring an investment cast barrel shaped crown and gently curving legs. stylish and practical, the forks bear mudguard eyes and enough clearance under the tektro calipers to fit a set of full wood fenders if desired. all the tubes could easily be described as skinny, and i'm not afraid to intend this as a compliment. 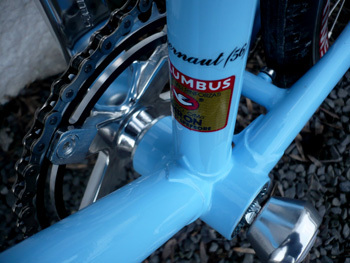 as i may have pointed out in the opeing paragraph, construction is entirely tubes and lugs, painted in a luxurious sky blue that attracted more compliments than i've ever received for a review bike in the past. the frame is phosphate treated prior to application of that thick outer coating in order to prevent corrosion, something that affects the pacific northwest as much as it does the scottish west coast. a pair of track ends at the rear give the game away that this frame also surfaces elsewhere in the traitor range as a fixed wheel variation, something that also accounts for the slightly higher than normal bottom bracket. in this particular guise, those dropouts are home to a sturmey archer three speed hub. in fact, sturmey archer have quite a lot to say on this bicycle; the front high flange hub is also sourced from sturmey, as are the cranks, etched on the outer face with the sturmey logo. however, it is no secret anymore that sturmey have gone a similar way to that of brooks saddles, and are now no longer in british ownership. this is rather brazenly advertised by the stamping of sunrace on the back of the left crank arm. this is not a criticism; cycling is no longer concentrated in european hands, and if it works, whose bothered about nationality? that sturmey/sunrace right hand crank arm featured a 42 tooth single chainring, turning a 3/32" chain over a 16 tooth sprocket at the rear. sometimes it's nice not to have a front derailleur. 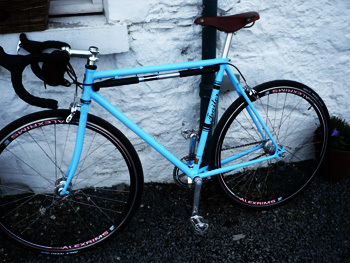 and it was also nice to re-acquaint oneself with that tried and tested square taper bottom bracket. none of your outboard or press-fit bearings hereabouts. the wheels supplied were sturmey 36 hole hubs laced to a pair of alex deep(ish) section rims, shod with a pair of halo 700 x 29c twin rail courier tyres. the alex rims are rather confusingly labelled race 32; confusing because both wheels were 36 spoke. i'm assuming the 32 refers to the number of millimetres occupied by the rim depth. stem, bars and seatpost are all supplied by kalloy. atop the seatpost on the review bicycle was a black quilted example that not only failed to look the part, but during a remarkably brief encounter with my backside, was particularly uncomfortable; i changed it for a brooks team pro which not only cured the comfort problem, but immeasurably enhanced the luggenraut's appearance. brake levers and calipers were from tektro, the levers being a blast from the past, so to speak. it's many a year since i've ridden with levers that don't have those little flip levers between blades and bars. very minimalist yet again. and at the end of the right hand drop bar is a neat little bar end lever sporting three positions to change those hub gears. in keeping with the purpose for which this bicycle was designed, i attached a zimbale tan leather bag over the handlebars in order to carry an inner tube, tyre lever and crank brothers multi-tool. with frame and forks weighing a tinsy over 3kg and a three speed hub at a few grams over 1kg, we're already well on our way towards the uci minimum weight limit before wheels, cranks, pedals, bars saddle etc. in short, this isn't a light bike, at least not by colnago standards, but that's not really the point. folks have been riding bikes heavier than this since time immemorial; to be quite frank, the fussing over weight is over-rated. take the luggernaut out the bikeshed and ride it like you would your favourite carbon, is to have disappointment writ large. while that little columbus bird advises that the frame has been considered with at least some slight degree of performance in mind, the reality is that several components look the other way. thus trip number one was to the far south in order to replenish the might dave's gear cables. 60km ought be enough of a round trip, incorporating two coffee stops, to settle down and enjoy the scenery. sadly, my mind was not where my legs were trying to be, and i fear i overdid the oscar freire impersonation. side effects however, were worth taking note of. despite the many years since sturmey archer entered this world, and their relatively recent disappearance to pastures foreign, nothing much has changed. the small plastic lid over the oil port has gone; the sturmey is now a sealed unit. but the gearing's just the same: 33% percent reduction in 1st, direct drive in 2nd, and 33% up in 3rd; never the right gear at the right time. the trip to port wemyss and back proved that. it's pretty flat until leaving port charlotte, then the road becomes a smidgeon rolling, and an islay headwind did little to lighten the load. 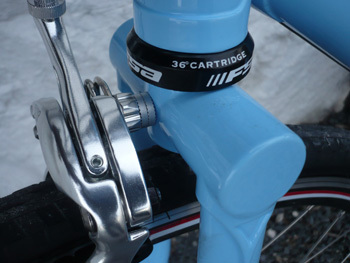 the bar end lever was easy to use, once i'd convinced myself that there was no ergopower/sti on the bars. that headwind proved the need for drop bars; the traitor photos i was sent show the bike with something akin to mustache bars, and those would never do. over the rolling stuff, and that lever stayed in gear number one for most of the distance. the one hill at octofad was a bit of a struggle, but the columbus frame offers a not inconciderable degree of assistance simply through its liveliness in the face of adversity. such a primary component of the luggernaut was undoubtedly the heart and soul of the party. 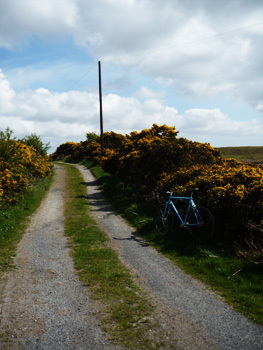 the return journey faced the same rolling hills in the opposite direction, but this time with the assistance of a more than pleasant tailwind, allowing use of those two other sturmey gears. though self-inflicted, that brooks team pro was a major asset in one's travels and it more than enhanced the look when leaned against the wall outside debbie's. in fact cafe society, whether urban or rural, is a most fitting backdrop for the luggernaut. that was approach number one. number two was far more considered. 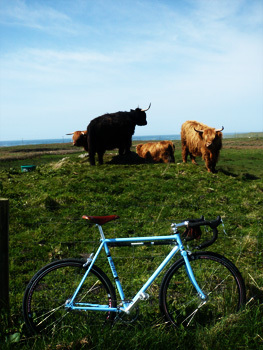 an islay wind rarely goes away, so there was little chance of a summer saunter, but accepting that the king of the mountains jersey was very much off the menu, and mark cavendish was unlikely to knock on the back door and ask to borrow it, brought on a new serenity. ride the bike as was originally intended and it was damn hard to stop smiling. headwind or no headwind, clicking into whichever seems to be the more appropriate ratio let road and weather dictate the pace, and it's hard to think of a more accomplished bicycle. the 29c tyres isolated all but the largest of potholes, and the superbly built steel frame did much of the rest. the wheels were a touch on the harsh side, likely due to the deep(ish) flange rims; standard flat rims would not only have been more appropriate in the rotating stakes, but would have surely been more favourable in the aesthetic realm too. faux aero rims are completely unnecessary on a bicycle of this type. as mentioned above, i had attached a zimbale leather bar/saddle bag to the handlebars i order to carry those cycle trip essentials. however, i was several rides into my review before realising that both front and rear wheels were completely devoid of quick release levers. 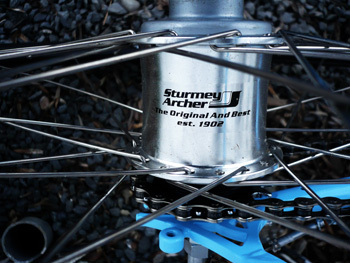 the sturmey may be considered a welcome throwback to a past era, but it comes with that same era's 15mm wheelnuts. had a puncture reared its ugly head, i'd have been well and truly stuffed. 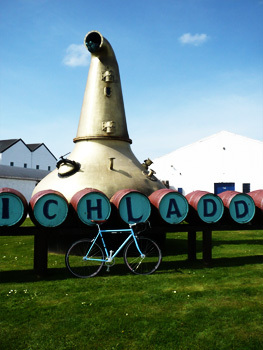 the luggernaut's final trip on islay was, traditionally enough, to ardbeg distillery to view and photograph their fabulously decorated orange county chopper. dressed as a human being with regular trousers and other than polyester top, this was the ideal machine for travel. it might be aimed fairly and squarely at the urban market, but us country boys have our moments too. forget your fixies; those are yesterday's news. real cyclists with attitude ride sturmey three-speeds, no matter where we buy our coffee.